Mind Garden is dedicated to the growth of the human potential. Important for wisdom and growth is a good sense of humor. On this page is humor that we enjoy. We welcome you to contact us if you find similar humor that needs to be shared. The Non-Verbal Measure of Stress was most recently used in a case study on stress level at St. Mary's Hospital. Click the arrow below to reveal an image of two dolphins jumping out of the water. 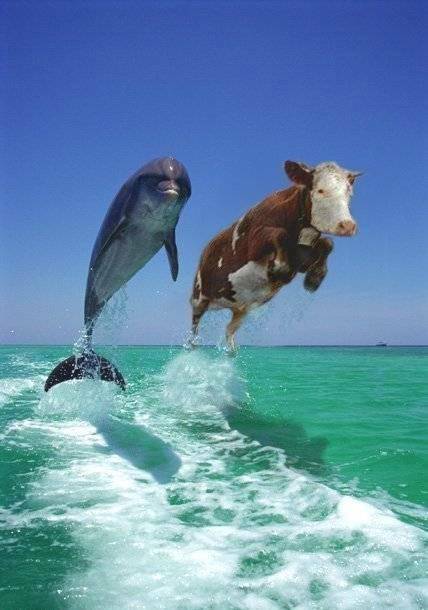 The dolphins are identical. A closely monitored, scientific study of a group revealed that in spite of the fact that the dolphins are identical, a person under stress would find differences in the two dolphins. If there are many differences found between both dolphins, it means that the person is experiencing a great amount of stress. Click the arrow below to reveal the image. If you find more than one or two differences, you should consider taking a vacation. Click here to reveal image. you should consider taking a vacation. This unusual personality inventory was developed in the late 1970s by the Dynamical Institute of Psychology, Phycology, and Negative Dialectics (DIPPAND) in Berkeley, California. Whereas other personality inventories claim to measure pre-existing qualities of the human personality unmarred by the experience of taking the test, the DIPPAND items were selected for their ability to transform the test-taker. In other words, in the course of providing answers to the items and plotting one’s profile, the test taker becomes the type of person indicated by that profile. Now that your personality has been transformed, you can intuit how you score on each DIPPAND scale. Indicate your raw score for each scale, and then compare your new personality to that of your colleagues. Copyright © 1979, Kenneth A. Moselle, Avril Thorne, F. L. Jessica Ball, David Schuldberg, Joseph P. Christy, Kathy Ann Miller, & Andrew Lichterman. Dynamical Institute of Psychology, Phycology and Negative Dialectics, Berkeley, California. All rights preserved. "The secret of life is honesty and fair dealing. If you can fake that, you've got it made." Never assume conspiracy when incompetence will suffice.